Every dish that is served during Chinese New Year have an auspicious meaning behind it! Today, we’ll be bringing to you this recipe prepared by Jessie Koey, who is a stay home mum and a recipe blogger. 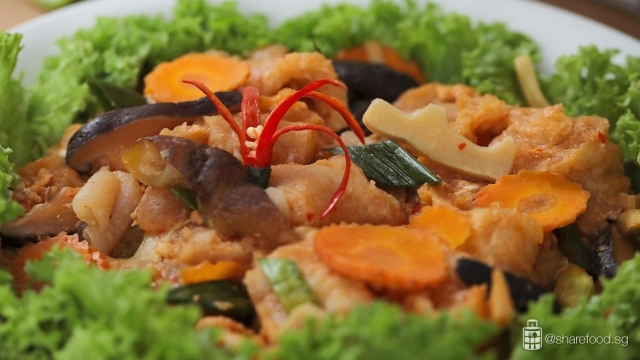 In her home town back in Malaysia, this is a family classic dish – Sweet and Sour Sea Cucumber with Fish Maw. Her passion for cooking is driven by her family, as well as 3 of her boys who has huge appetites! What other way to show our appreciation for our family than to cook? I’m sure that no words can describe the feeling when you’re looking at your loved ones enjoying every bite of your food. So, what are you waiting for? Let’s get down to cooking! Here’s a list of ingredients that you need: bamboo shoot, carrot, shiitake mushroom, eggs, corn flour mixture, leek as well as some meat items such as prawns, chicken breast, frozen crab. Not to forget the main ingredient: fish maw and sea cucumber! You will also need to prepare some spices and condiments such as garlic, red chilli, chilli padi, ginger, vinegar, sugar, oyster sauce, abalone sauce, tomato sauce, chilli sauce, fish sauce and chicken broth! Did you know that eating sea cucumber symbolises that a family may be blessed with a new born during the year? Add in the sea cucumber, ginger and Chinese cooking wine and boil them for 5 mins. Did you know that eating sea cucumber during Chinese New Year is extremely lucky for new families? In Chinese, sea cucumber is pronounced as “Hai Shen”, which also means “giving birth”. Thus, this symbolizes that a family may be blessed with a new born during the year! With that being said, lets prepare the sea cucumber first! Cut them up and boil water in a sauce pan. Add in the sea cucumber, ginger and Chinese cooking wine and boil them for 5 mins, drain and set aside. Adding the Chinese cooking wine will help to get rid of the fishy smell from the sea cucumber. Next, lets prepare the fish maw. Soak them in water for 2 hours depending on the hardness of the fish maw. Then, rinse and squeeze out the excess water and cut them up. After all the ingredients have been prepared, add them into the Kenwood multi-chopper and pulse to chop the ingredients finely! With the Kenwood multi-chopper, it will save a lot of time to mince the ingredients together! With the Kenwood multi-chopper, it will save a lot of time to mince the ingredients together! For those who loves spicy dishes, chopping up chili will always leave that stingy effect on your fingers. But with the multi-chopper, in just a few pulses, you can get the desired results in the herbs and spices, even nuts! Plus, you don’t have to worry about cleaning up and keeping it away because the multi-chopper is compact in size and easy to clean. A great kitchen companion for Chinese New Year as you create flavorful Asian dishes! Interested? To purchase, it’s selling at $99 @ https://shop.kenwoodworld.com/kw_sg/multichop-2-in-1-chp501wh.html A really good deal! Stir to mix the ingredients and let it simmer for 5 minutes. Moving on, heat some oil in a wok and add in the minced spices and mushroom and sauté till fragrant. Add in the minced chicken and prawn till it’s ¾ cooked. Slowly add in all the condiments as well as fish maw, carrot, bamboo shots and crab meat. Stir to mix well and let it simmer for 5 minutes. Do not use sea cucumber that has a soft texture, as it will become mushy when cooked. Instead, choose the ones that are firm to touch and hold. Here’s where your main ingredient – sea cucumber comes in! Do not use sea cucumber that has a soft texture, as it will become mushy when cooked. Instead, choose the ones that are firm to touch and hold. Add them in and let it simmer for 8 minutes. Also, did you know that sea cucumber is incredibly nutritious? They have been touted as a natural remedy for high blood pressure, constipation, high cholesterol and even common cold! We are almost done! Add in the leek and stir to mix evenly before adjusting the taste with your condiments. Stir in corn starch and drizzle in a beaten egg. Lastly, sprinkle some coriander leaves for garnishing and serve! 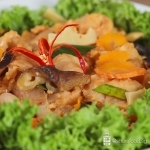 This mouth-watering dish has high nutritional value, perfect for Chinese New Year. There you go! Sweet and Sour Sea Cucumber with Fish Maw. 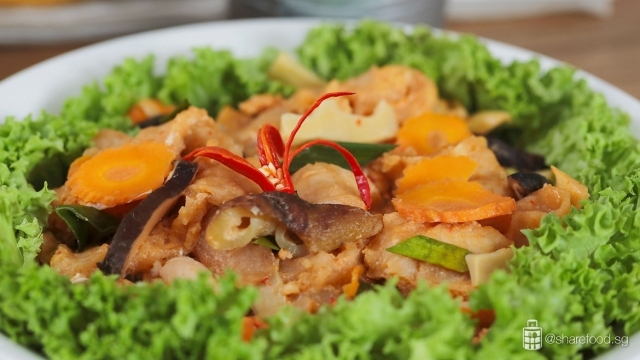 This mouth-watering dish has high nutritional value, perfect for Chinese New Year. A nourishing dish along with a well-deserved break this festive season. Your body will thank you! 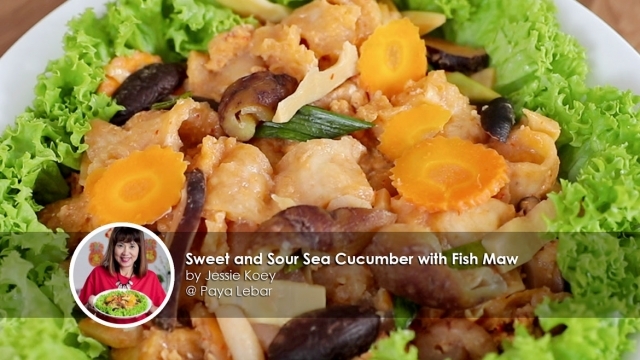 If you’re interested in more recipes from Jessie, do visit her recipe blog ! She has been documenting more than 200 recipes since 2015 in order to upkeep her late father’s legacy of cooking delicious home cooked meals. Do check it out and try out some of her recipes! Sea cucumber: Cut into 3cm width. In a saucepan, boil water. Add in sea cucumber, ginger and chinese cooking wine. Boil for 5 mins, drain and set aside. 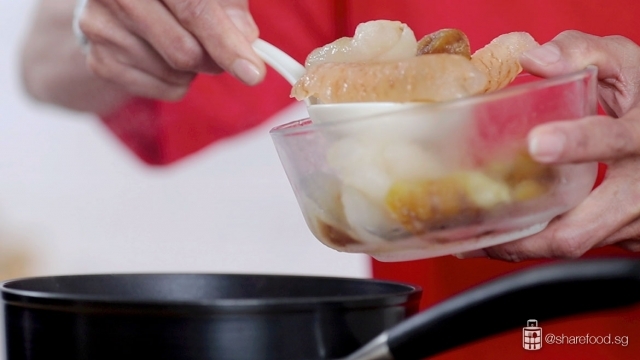 #Tips: Chinese cooking wine will get rid of the fishy smell from the sea cucumber. Fish maw: Soak in water for 2 hrs depending on the hardness of the fish maw, rinsed and squeezed out the water and cut into 2 inch width. 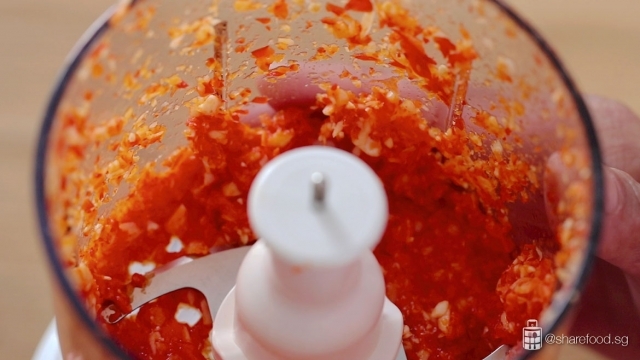 Mince the spices: Add all the ingredients into the Kenwood multichopper. Pulse to chop the ingredients finely. In a wok, heat 2 tbsp oil. Add in minced spices and mushroom. Sauté till fragrant. Add in minced chicken and prawn. Sauté till ¾ cooked. 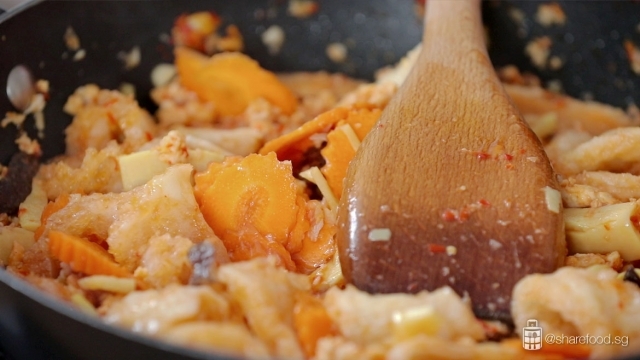 Add in all the sauce ingredients, fish maw, carrots, bamboo shoots and crab meat. Stir to mix well and let it simmer for 5 minutes. 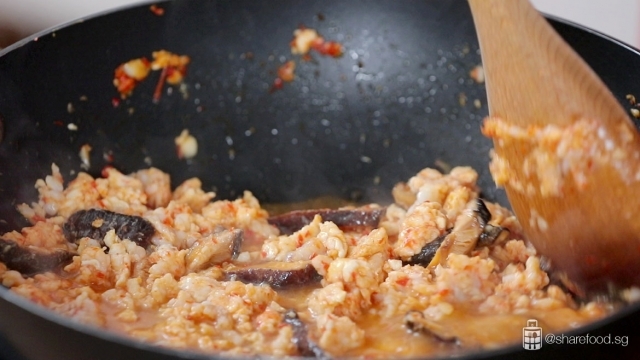 Add in sea cucumber and stir to mix well, let it simmer for 8 mins. Add in leek, stir to mix evenly. Adjust the taste with the sauce ingredients as desired. Stir in corn starch mixture and drizzle in the beaten egg. Sprinkled coriander leaves and serve immediately.